An optical polarizer is a material that takes random, multi-directional light and allows light vibrating in only one plane to be transmitted. An analyzer is a second polarizer that is used to test the orientation of the transmitted light. 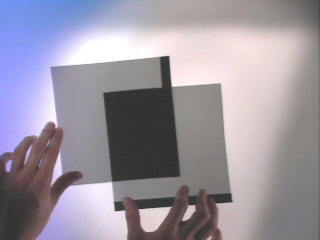 Polaroid filters transmit 50% of unpolarized light. In the following animation, feel free to rotate the polaroids located between the light source and the 35-mm camera. In the animation, the lines on the polaroid show the axis of the polaroid. When the axes of the polaroids are at a right angle, all light is depleted. At the angles between 90º and 270º, the change in the degree of the angle alters the amount of light passed through to the camera. The next applicable demonstration shows a polarizing filter and its effects in photography. A polarizing filter is used as an analyzer and, when correctly aligned, create images that are clearer and more colorful. To use this animation, click the picture at any location to move the lens to that area. By clicking inside the lens (circle), holding the button down and moving the mouse, you cause the lens to rotate, changing the amount of light allowed through the lens. The actual relative direction corresponds to the pair of sunglasses in the top left corner of the picture. Glare is often defined as horizontally polarized light that has been reflected off a nearby surface. This light is easily blocked with a vertically polarized analyzer usually in the form of polaroid sunglasses. Our desire is to remove the need for sunglasses by stopping the transmission of the glare to the driver by treating the windshield with a nano-optical film that allows sufficient ambient light to meet ANSI/SAE standards. In 2004, D.R. Solli and J.M. Hickmann showed that the "polarization of electromagnetic radiation could be completely controlled using devices constructed entirely from photonic crystals." Later in 2006, Robert Norwood of the University of Arizona stated that "photonic crystals have now started to make the transition from basic to applied research."